New Moon Blog: Not in Kansas anymore. 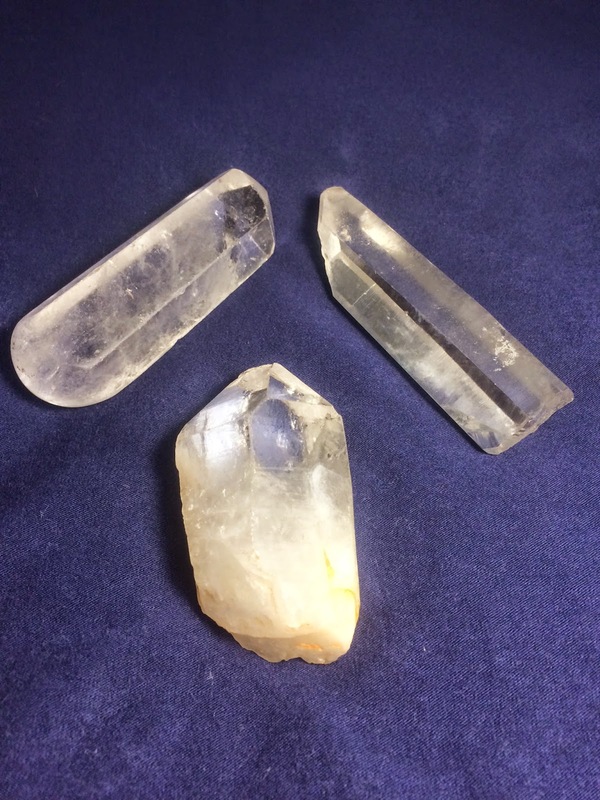 Yes, these are my crystals! Although you, my faithful readers, have long known or at least suspected, what I am about to reveal, it will be crystal clear by the end of this post. I am now officially out of the metaphysical closet. After The Day my Life Changed Forever it was as if a portal opened up to a delightful and powerful new way of experiencing the world. I was thrilled to discover that the unusual benefits I was enjoying were also happening to so many others in similar circumstances. My favorite of these is the ever increasing occurrences of synchronisities in our lives. I am deepening my understanding of how our most difficult life transitions have the potential to become our greatest gifts. I have been exploring this wild terrain, following bread crumbs and connecting dots for the past 5 years both experientially in my personal life and through the fascinating stories and research of others. I can't wrap it all up neatly in a blog post and probably not even completely in the book that it is now clear I need to write. Mystery and chaos are gloriously messy and defy explanation by their very definitions. Both of these aspects figure prominently in what I will eventually unpack in greater detail at a later time. So please be patient. In the meantime, I am continuing to share my unfolding story in this and subsequent episodes of the New Moon Blog. I promise to be truthful to the best of my memory and refrain from exaggerating. I am just letting you know, it is going to get a little weird! I will also share some reports and research findings from brilliant scientists, sensible scholars, respectable business leaders, former skeptics and others who have credentials far more impressive than mine as well as masses of ordinary folks with astounding, well documented tales in my Full Moon Newsletters. It is my hope that when you are in the throes of your next life transition, these stories and findings might open up some unconsidered possibilities for you or perhaps serve to reinforce what you already know. I had seen people leave items in the center as offerings, so when I discovered that I had been accepted for an interview at the graduate school I desperately wanted to attend, I placed a tiny circle of paper with the school's logo under a fist sized rock in the middle. When I returned the next day, I lifted the rock to look at the logo and saw a tiny green sprout had pushed it's way through the hard desert soil growing right next to the logo. There were no sprouts under any of the other rocks. I checked. Since I was nervous about flying into San Francisco, finding the school and going through the interview, I was willing to take anything that looked like a good omen! When I returned to the labyrinth (the day after the interview - which had gone quite well), and lifted the rock, the little sprout had grown. I began preparing for my trip back to the Midwest where I was going to tie up some loose ends before heading to CA. I was anxiously watching the mailbox for my letter of acceptance and superstitiously monitoring the health of the sprout. A couple of days before I was ready to leave, while hiking in the desert, I got a call on my cell phone from one of the professors who had interviewed me. She told me that it was the policy to just send out letters, but she wanted to call me personally. She said that the committee had really liked me and she hoped I would apply the following year but that given my life circumstances (in the middle of a divorce and many major life changes, as well as traveling around the country with all of my belongings in my car) and the rigorous nature of the program, they were concerned that it would be too much for me. In retrospect, I can't begin to convey how grateful I am that they turned me down, but at the time I was devastated. 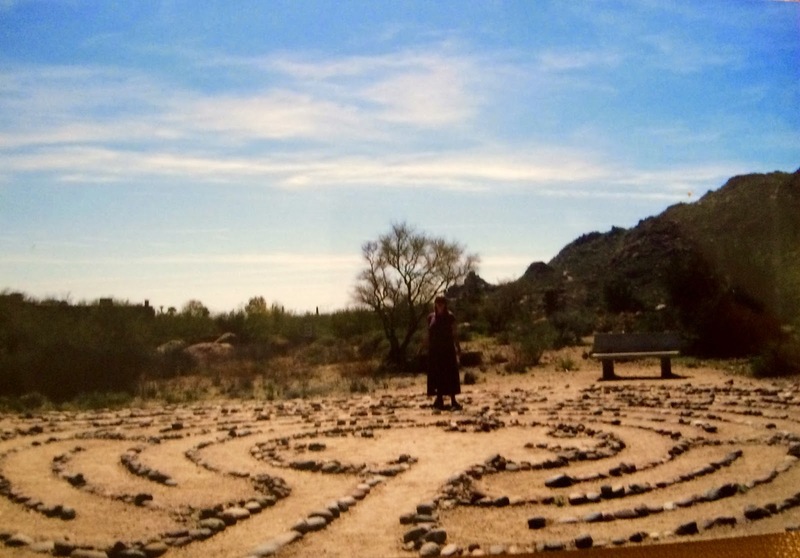 When I went to the labyrinth that evening, I discovered that someone had kicked around all of the rocks in the center. The logo was gone and the sprout had been trampled. It was brown, withered and quite dead. A few days following this disappointment, I pulled into a motel in some Nebraska exurb after a long days drive. The only thing resembling nature in the endless warren of nearby strip-malls was a half frozen swamp. After tramping around it until nearly dark, I was out of options for local entertainment. At the beginning of the trip, I had hastily grabbed a few books at a used bookstore from the dollar shelf and had only one left that was unread. It was bordering on being too woo woo for me, but since I don't watch TV, it was the only game in town. One chapter described an obscure goddess I had never heard of called Azna. I was instructed to ask Azna for whatever I most wanted and to list it in as much detail as possible. If Azna was going to grant my wish, I would receive roses within a week. My burning concern at the time was finding a new home. I figured it would probably be helpful for me to articulate exactly what I wanted on paper, regardless of Azna and her roses. I wrote out a very detailed and long list describing the apartment I wanted. I have always loved the cozy, safe feeling of small, easy to clean spaces vs a house and had many specific wishes. I also put in my order for the type of community I wanted to live in and the kind of people I wanted to meet there. I specified nearby natural beauty for hiking and Redwoods and Palm trees in my neighborhood and no more than an hours drive from the beach. I asked for a natural food store and library within walking distance, and much more. I did not know exactly where it would be, but I was aiming for somewhere between Santa Cruz and Fort Bragg in NorCal. I truly had no expectations that Azna was going to deliver the roses or the home, but I admit I was a tiny bit disappointed that no roses appeared. Seven days after making my list, and nearly seven months after ~ The Day My Life Changed Forever~ , I returned to Milwaukee for a quick visit. It was late in the day when I arrived at the home of some children whom I had cared for one afternoon a week from the time they were infants until my abrupt departure. After a joyful reunion with my adored twins and their parents, they helped me haul my suitcases up to the guest room. There on the dresser was … a vase of red roses. I stopped and exclaimed in wonder. "ROSES?!!!" The children's mother said that she had taken the kids to the floral section of the grocery store to get me some flowers. She thought perhaps some daisies or carnations, but my little darlings adamantly insisted on the pricier roses. After bouncing around from place to place for another six months, I found my home. It is the exact place I described - only even better. I have been here for 4 years and 4 months. I fall more in love with my home and my life here every day. The only item on the entire list that I did not get was a bathtub. Shortly after I moved in, I was taking out my recycling and met one of my neighbors. We talked about how much we loved living in our building and I told her the story of Azna and how I got everything except the tub. In Fairfax - a.k.a. "Mayberry-on-acid" - this kind of story is taken in stride. She promptly gave me an extra set of keys to her apartment and said "Now you have a bathtub". Oh, I forgot one more detail. The day I found the place, I was telling a friend from MN how excited I was. 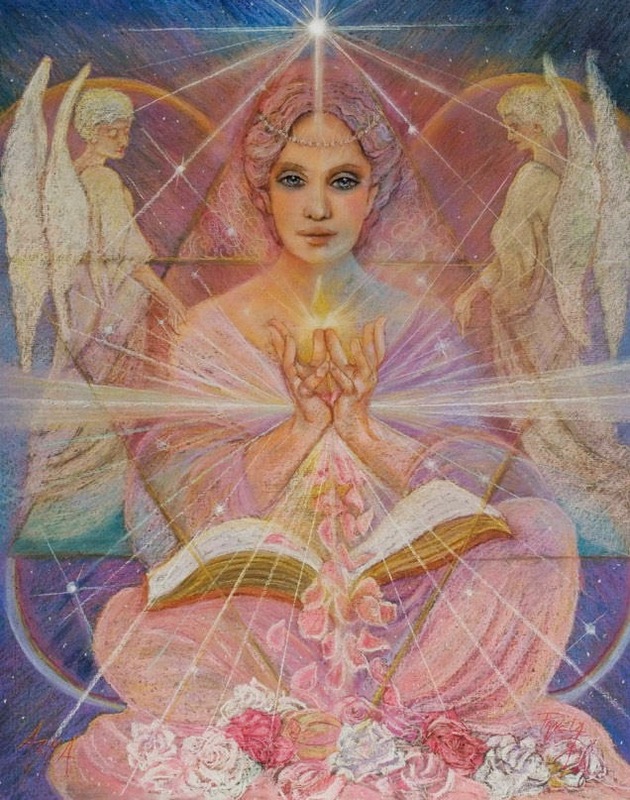 In the course of our conversation, she told me that she was receiving communications from the Goddess Quan Yin. I told her (a bit tongue in cheek) to put in a good word for me. She was silent for a moment and then said "Quan Yin says to tell you she will be watching over you in your new home." 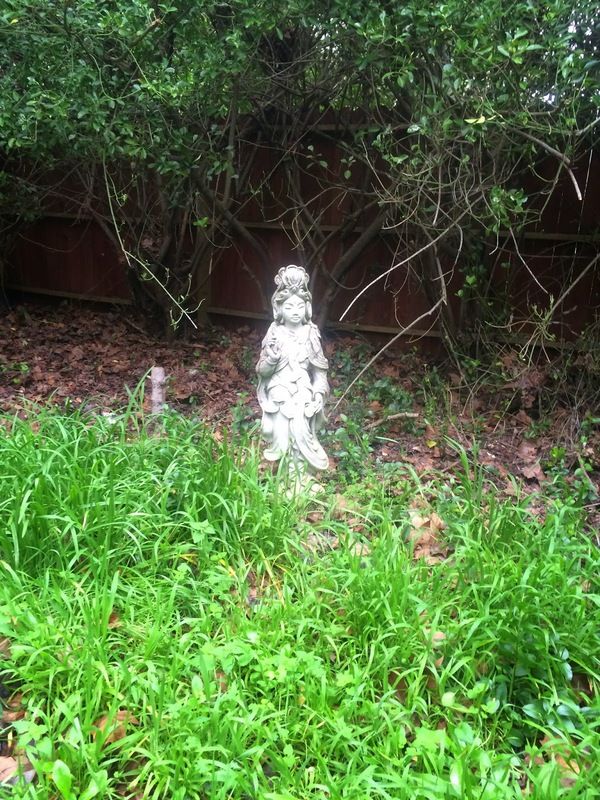 As I was moving my stuff in, three weeks later, I noticed the Quan Yin statue in the yard staring directly in the window of my new home. She is watching me as I type this. If any of you have similar stories to share, I would be overjoyed if you would share them in the comment section, but if for whatever reason you prefer to send them via email or Facebook, I would still love to hear them. I have learned that the more attention we pay to synchronicities, the more they appear and the more they can offer gifts to help navigate times of uncertainty. Scoff if you will, but I will take the magic and joy I now have over my former way of life anytime! And now if you will excuse me I need to feed my unicorn. Tears of joy for how that journey unfolded. Keep this blog for your book, of course. I am delighted to observe how well you can articulate your feelings. BRAVO! !